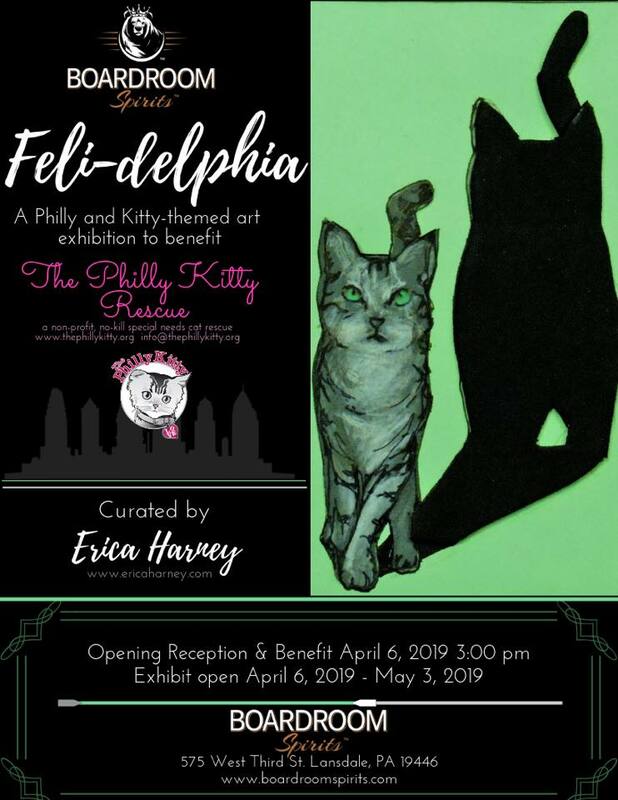 It is my pleasure to formally invite you to FELI*DELPHIA: Art Exhibition to Benefit the Philly Kitty Rescue! This is a passion project I have been working on throughout the winter: I’ve organized a group exhibition of over 60 “Philly” and/or “kitty” themed artworks, the proceeds of which will benefit this very special volunteer-run organization that rescues, fosters, and provides medical care for stray and homeless cats and kittens across greater Philadelphia, especially those with special needs. TPK is an organization very close to my heart: a lifelong animal lover, in 2017 I adopted my cat Rufus from them and have since developed a personal relationship with TPK’s founders as well as Rufus’ former foster families. Now I can’t imagine life without him! The event is being generously hosted by Boardroom Spirits Distillery in Lansdale, PA, a northwestern Philadelphia suburb, on Saturday April 6th from 3-8pm. During these hours, Boardoom will even be donating a percentage of their revenue to TPK. Read more information below! In other news, I am currently exhibiting at two of the schools where I teach: Cecil College in Elkton, MD and the Wallingford Community Arts Center in Wallingford, PA (Media/Swarthmore). In the studio, I am continuing work on the second installation of paintings for Fulton-Montgomery Community College in Johnstown, NY to follow last year’s WOMEN IN STEM series. Scroll down to read more on these and other events. Created especially for FELI*DELPHIA: EXHIBITION TO BENEFIT THE PHILLY KITTY RESCUE. Finally: if you like to support the arts, small and local businesses, or simply enjoy receiving updates about my local and regional art events and projects, please Tell a Friend!! Share this newsletter with others who might want to Subscribe. Thank you to Erica Harney for the content of this post. 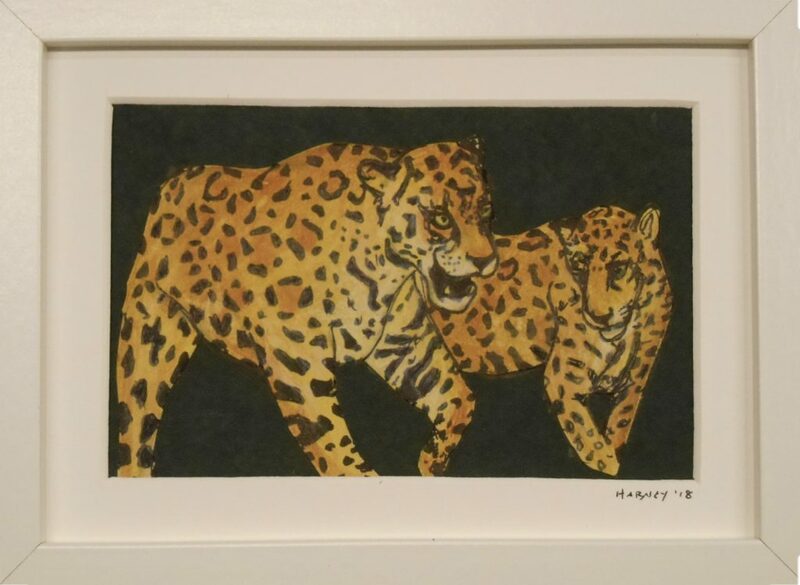 This entry was posted in Art, Art in Philadelphia, Collage, Collectibles, Crafts, Drawings, Fine Art Philadelphia, Folk Art, Mixed Media Art, PA Art, Paintings, Paintings Philadelphia, Philadelphia, Philadelphia Art, Philadelphia Art Shows, Philadelphia Artists, Philadelphia Artists, Photography Philadelphia, Social Practice, Uncategorized, Watercolors, Works on Paper and tagged Art, Art Show and Sale, boardroom, Boardroom Spirits Distillery, cats, DoNArTNeWs Philadelphia Art News Blog, Erica Harney, FELI*DELPHIA, FELI*DELPHIA: Art Exhibition Benefiting Philly Kitty Rescue, Philadelphia, philly kitty, rescue on March 23, 2019 by admin1. DoNArTNeWs Philadelphia Art News Blog shared a photo.